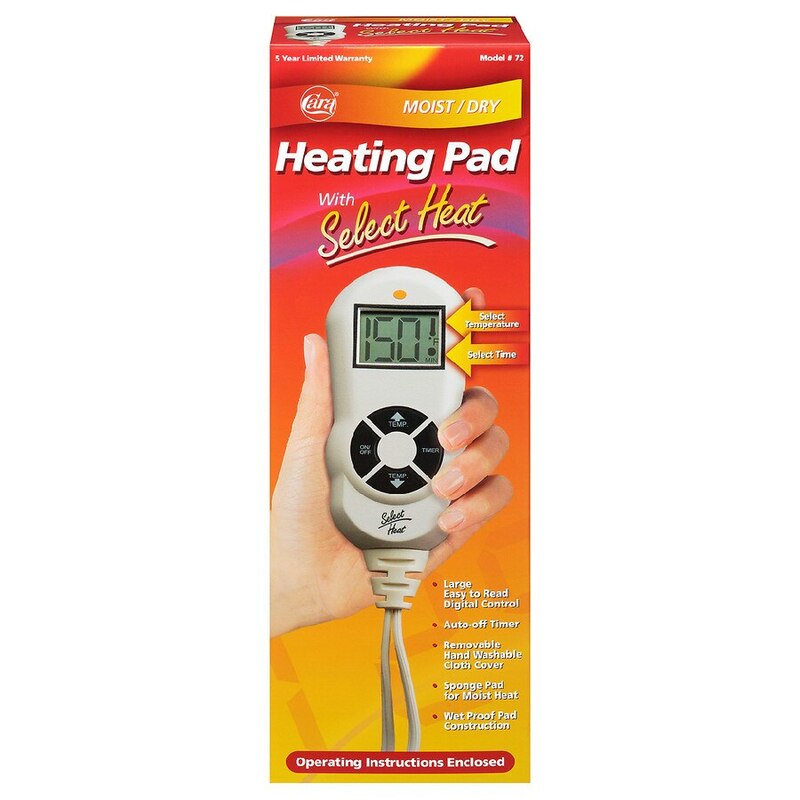 Heating Pad 12" x 14"
Cara®'s Moist/Dry Heating Pad with Select Heat Control is recommended for use whenever heat therapy applications are desirable for personal comfort, or as recommended by your physician for the relief of pain. Cara | Because we care. Dry Heat: Slip cloth cover over the heating pad. Plug into any 120 volt AC electrical outlet and activate pad as instructed. Moist Heat: Saturate sponge with warm tap water. Wring out excess water. Place heating pad and sponge into cloth cover. Plug into any 120 volt AC electrical outlet and activate pad as instructed. Do not discard. Important safety instructions. Household use only. Danger: To reduce the risk of burns, electrical shock, fire, and accident, this product must be used in accordance with the following instructions: Read all instructions carefully. Do not use pad while sleeping. Do not use pad on an infant. This pad is not to be used on or by an invalid, a paralyzed person, a sleeping or unconscious person, a person with diabetes, or a person with poor blood circulation, unless carefully attended. Do not use a pad on areas of insensitive skin. Burns may occur regardless of control setting. Check skin under pad frequently to avoid burning and blistering. Place pad on top of and not under the part of the body needing heat - burns can result regardless of control setting. This pad is provided with a removable cover. Never use pad without cover in place. Do not use pad in an oxygen enriched environment or near equipment which stores to fasten pad in place. Do not use pins or other metallic means to fasten pad in place. Do not lie, sit on or against, or crush pad - avoid sharp folds. Never pull this pad by the supply cord and do not use the cord as a handle. Carefully examine inner cover before each use. Discard the pad if it shows any sign of deterioration (such as blistering or cracking). Use this pad only on a 110-120 volt AC circuit. Unplug pad when not in use. Do not tamper with this pad in any way. There are no user serviceable parts. If for any reason this pad does not function satisfactionally, return to electric service station given in warranty. Do not use this pad with liniment, salve, or ointment preparations that contain heat producing ingredients. Skin burns could result medication. This appliance has a polarized plug (one blade is wider than the other) as a safety feature. This plug will fit into a polarized outlet only one way. If the plug does not fit fully into the outlet, reverse the plug. If it still does not fit, contact a qualified electrician. Do not attempt to defeat this safety feature.